What’s an obsessed canner and babbling botanist to do in the winter when canning opportunities are few and far between? Well take up a new hobby of course. Add some drink to all that food in the pantry! 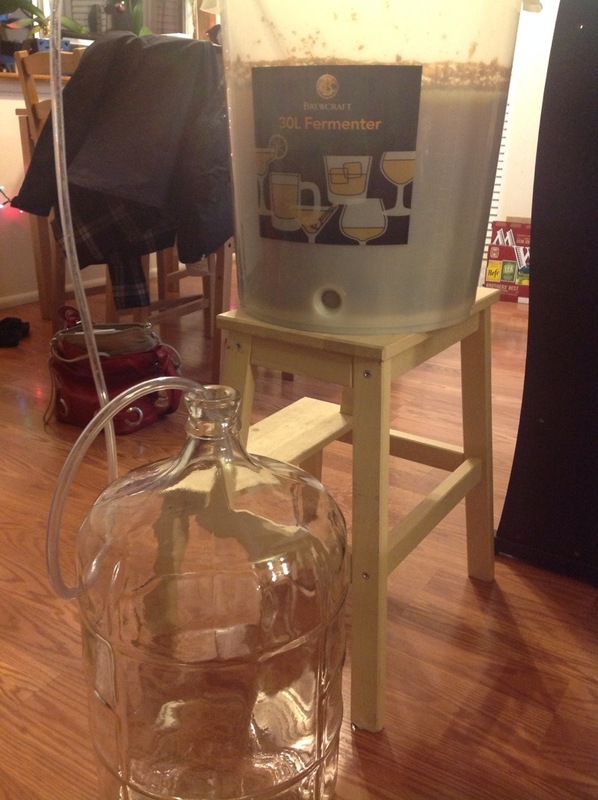 So the next skill I decided to add to my repertoire was beer brewing. Spoiler alert, next up with a post coming soon will be wine! This post is coming a few months after the making of our first brew, in fact we only have about five pints left! But what a perfect time to share it, now that I can reflect on the whole process and the deliciousness of the final product! 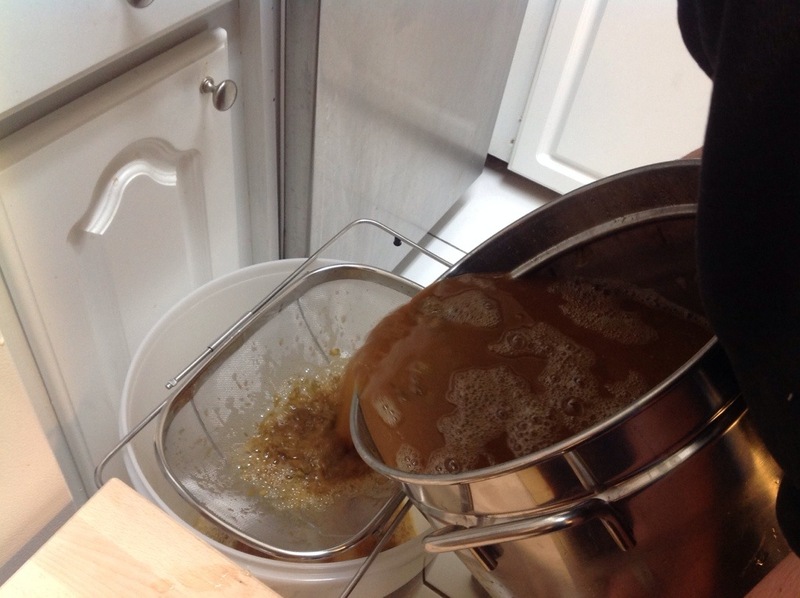 Making beer is maybe not as difficult as you may think, you should try it! We bought our starter kit at the local brew shop, but this kit is basically what you need to get started if you don’t have a local shop. Just add ingredients and bottles! OK, pull up a chair, I included the whole process in this post so it’s gonna be a long one! I don’t intend on making this a full detailed step by step because I’m not an expert (yet), but I’d like to make this a taste test into the brewing world and share the experiences (good and bad) of a first brew. If you really want to get into this, the best two books are How to Brew by John Palmer and The Complete Joy of Home Brewing by Charlie Papazian. I have both, and once I’ve finished this dang master’s degree will get back to reading them ;). The introductory instructions that we followed are from our local brew store, and can be found here. OK let’s dive in. How does one make beer? 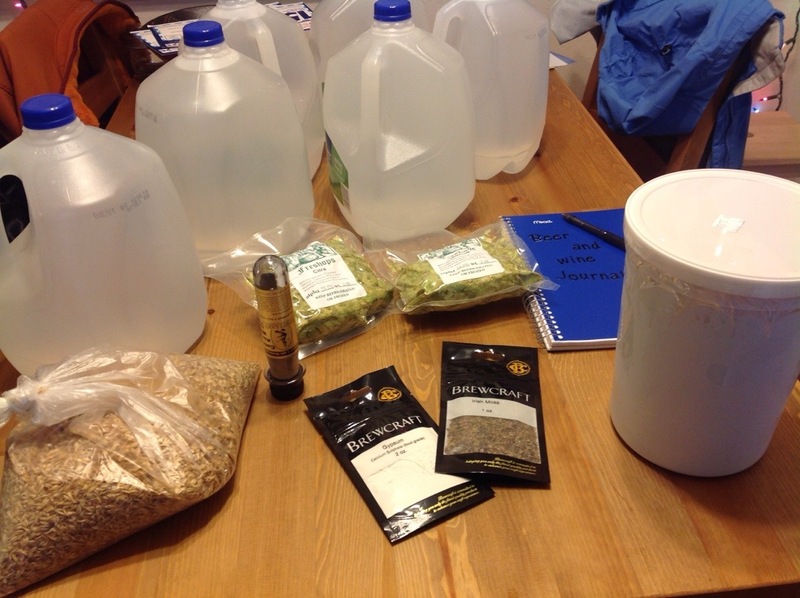 Everything you need for a first brew is pictured above. We did an IPA so you’ll see above 4 oz. of hops, 8 pounds of pale malt extract in the white tub, caramel steeping malts on the left, yeast, gypsum, and Irish moss (which strangely enough is not moss at all but seaweed) in the middle. And of course water and a notebook to keep track of everything. The first step on day one is steeping the grains in a few gallons of water and heating to 170 F.
Day 1, lesson 1: Don’t let the grain bag rest on the bottom, it can melt. We did not have this happen luckily, but had read that it can so our solution was to tie it to the fan assembly thing above the stove with twine. Best solution? Probably not. Day 1, lesson 2: See that floating thermometer below? Take a good look because that’s the last you’ll see of it. Those babies are fragile. Don’t drop them on the tile floor. 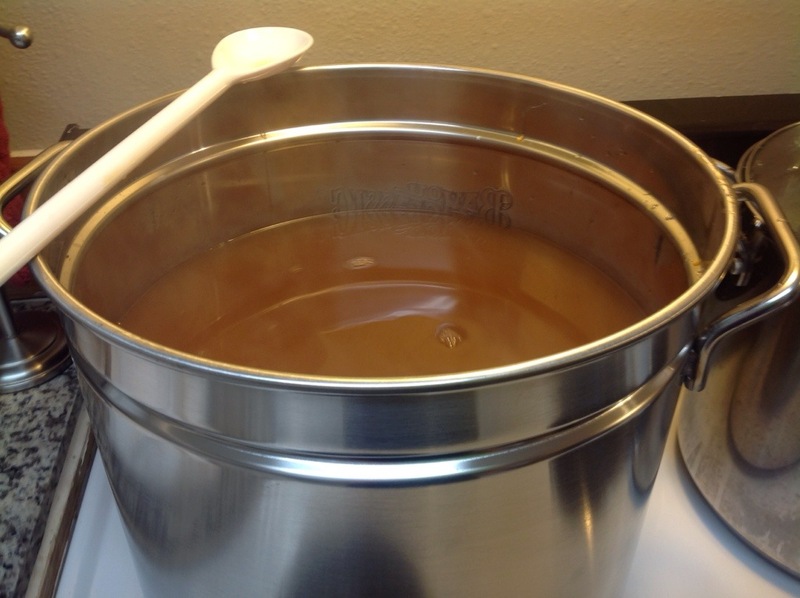 After you’ve reached 170 F and waited 10 more minutes you’ll remove the grain bag, push out as much liquid as you can, turn off the heat, and add the malt extract. Most beginner like us start out with malt extracts. Make sure the heat is off and stir in that gooey deliciousness. Check it out. Now we have wort! That’s fancy brewspeak for the brown water that will be beer. Turns out brewers like to use a lot of fancy words. Doesn’t look too appetizing just yet. Now we’re going to bring our wort to a boil. A lot of beers boil for an hour, some an hour and a half, and add a few more ingredients along the way. Hops! 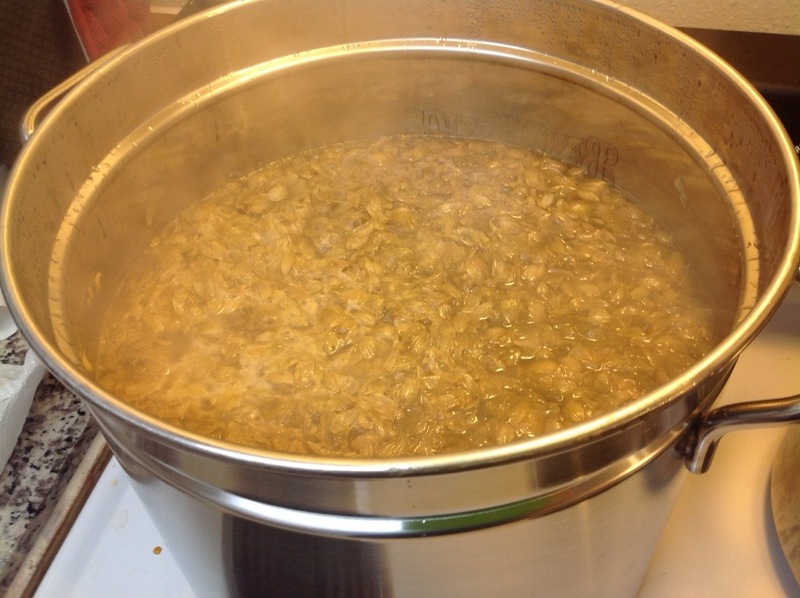 Once the beer was boiling, it was time for the hops. Hops get added at different times depending on the flavour you are going for. For this recipe, IPA, 2 oz went in a the very beginning. These are the “bittering hops.” Basically, the longer hops boil, the more bitterness is imparted on the beer, and the less flavour and aroma. So to also get the flavour we added an additional half ounce at 20, 15, 5, and 0 minutes (with 60 being your start time and you are counting down). That’s about as tough as it gets! Now you just watch it, make sure it’s not boiling over, and stir so nothing burns to the bottom. Oh, and add some gypsum and Irish moss at about 30 minutes. 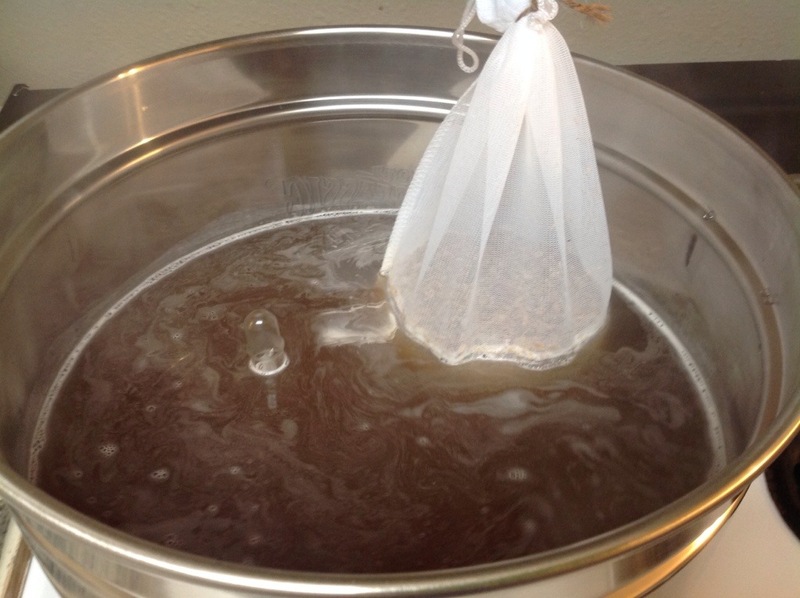 After your hour boil is finished, you need to cool the wort as quickly as possible. The easiest way, without buying extra equipment, is with an ice water bath like this. 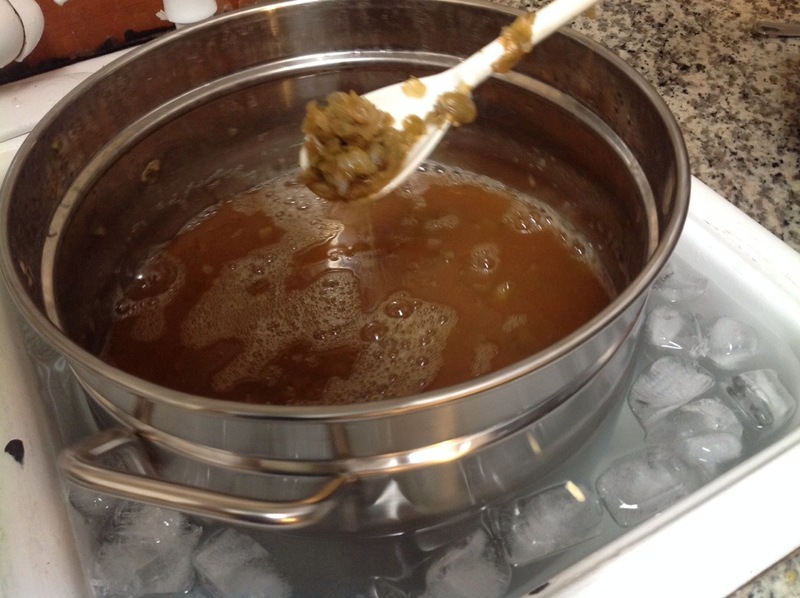 However, it cools a lot quicker if you send $50 or so on a wort chiller. It seemed silly at first to get one, but we did after a couple more brews and it was well worth it, the beer cools much more quickly. It sucked waiting and waiting and spending a few bucks on ice each time since we only have a couple of trays and it takes a lot of ice. 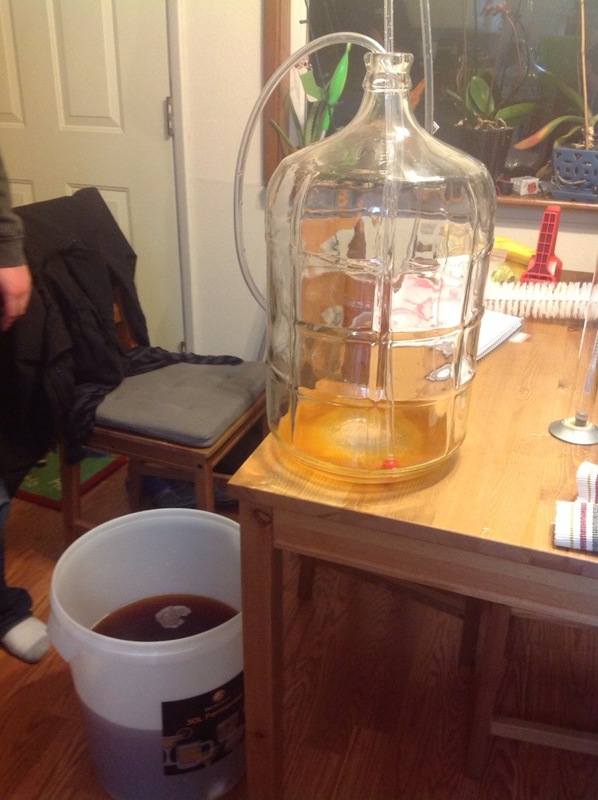 Once it’s cooled to about 70 F, room temp, you’ll dump it into your sanitized primary fermenter. We found this sweet strainer at bed bath and beyond that fits perfectly to catch the hops. You then top it off with water so you have a total 5 gallon volume. It’s ideal to have a huge pot so you don’t have to top it off, but when you first start out this might be how you do it. I can’t say my palette is refined enough to really notice a difference between topping it off and boiling the entire volume. Last thing to do today is take a hydrometer reading. Yay more fancy chemistry terms! Basically a hydrometer is a floaty device that you use to measure how much sugar you have in your wort. The yeast you are about to add will eat the sugar and therefore you need to know how much you have so you can calculate the final alcohol percentage. Lastly, you pitch the yeast! Pitch means, dump that yeast in there. Now we put on the lid and wait. Wooo fermentation! 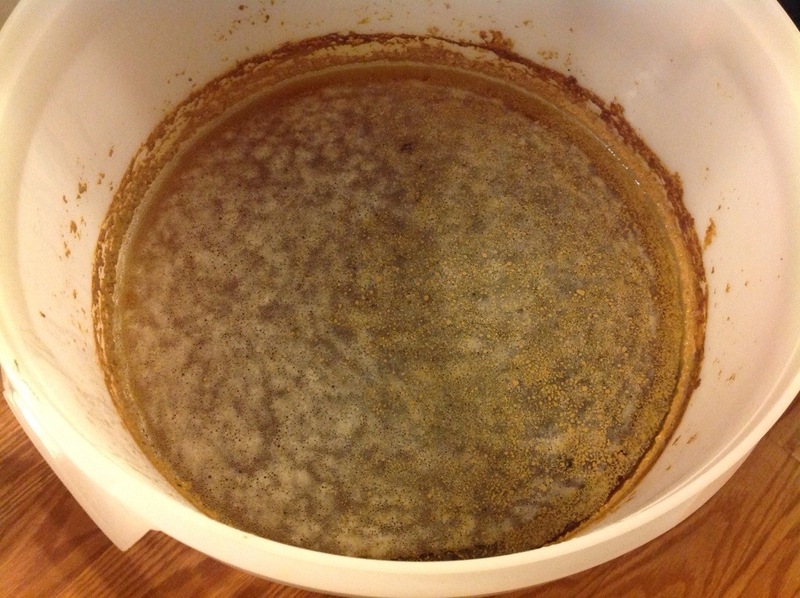 For about 7-10 days it stays in the primary fermenter. 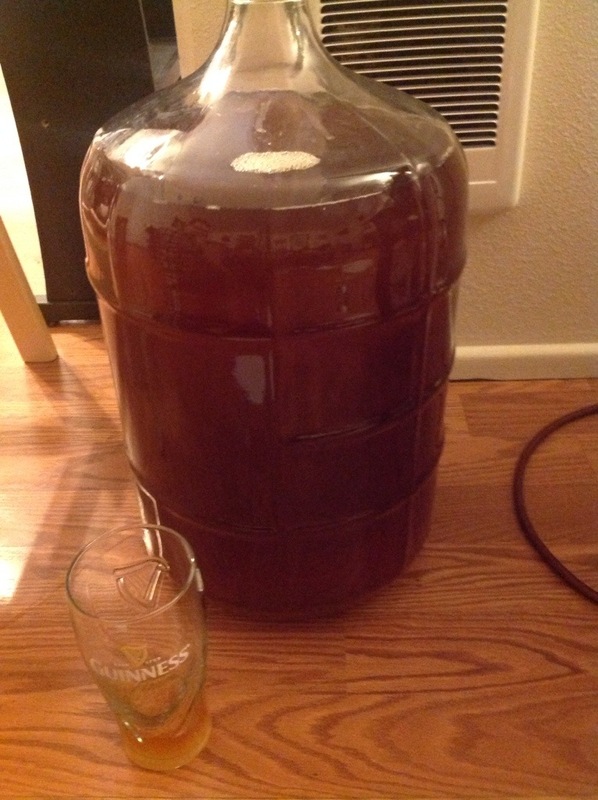 After a day or two you see vigorous bubbles in the airlock. That means it’s working! 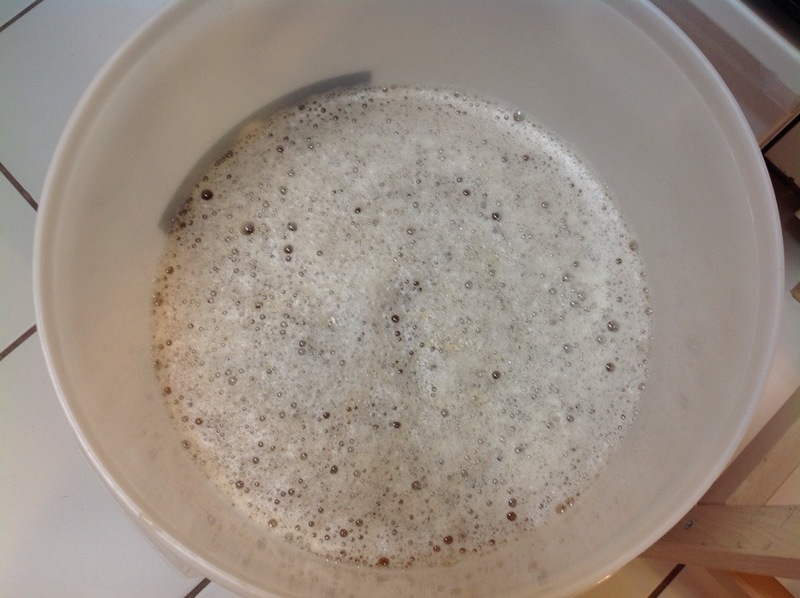 The bubbles are carbon dioxide from the yeast eating up your sugars. nom nom nom. 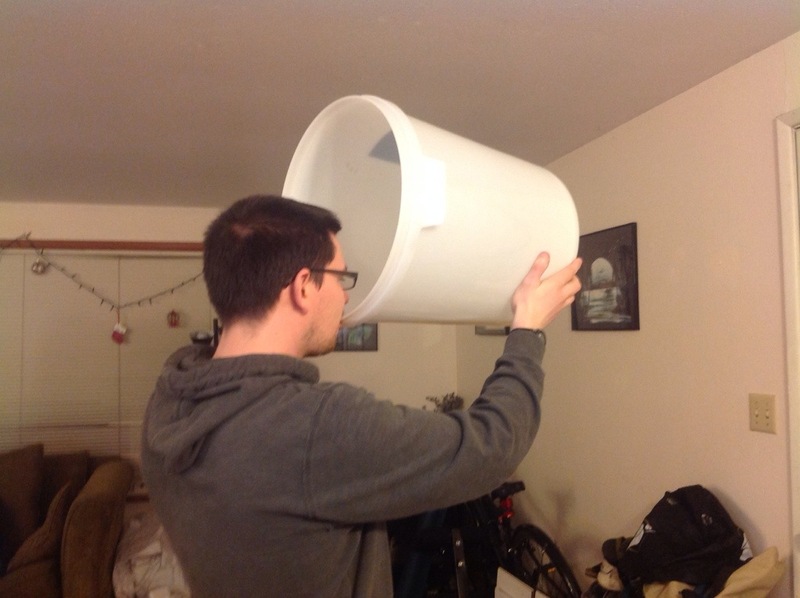 Once you are down to about one bubble every minute, it’s time to transfer containers. Or to use fancy brewspeak, we are racking the beer into the secondary fermenter. Now we’ll take another hydrometer reading to see how much sugar is left. Day 10, lesson 1. The higher the primary container the better. Gravity people, she can be your friend or your enemy. The table or counter is better than this stool. mmm check out that nasty sludge left over. Now we wait some more. 7-10 days again minimum. You basically can bottle once you’ve taken a few hydrometer readings and it hasn’t changed. That means all the yeast food is gone and they will be sad and die. Leaving you with delicious beer though of course. Don’t be sad for them, they lived a very fulfilled life in beer. And a few of them will live on a little longer to carbonate your beer. It’s bottling day yipee! The hydrometer readings are now steady and below what is specified in the recipe you followed, so its time to bottle your beer. 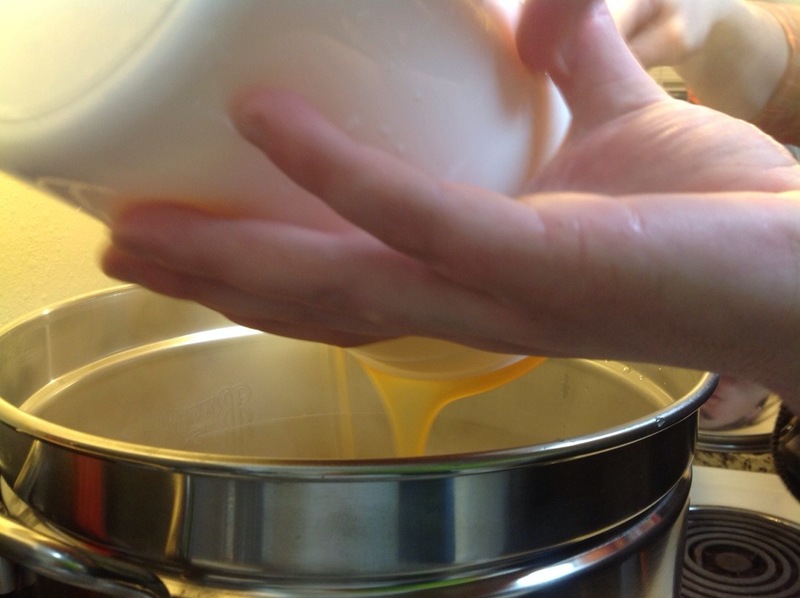 First you’ll dissolve 3/4 cups of dextrose in water and put that in your sanitized primary bucket. This will be eaten by the yeast to carbonate the beer. 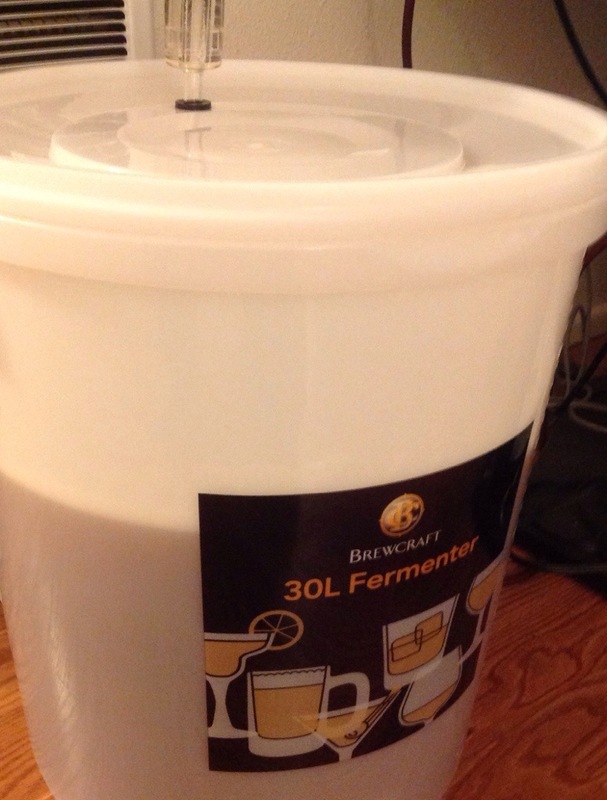 Then you will rack the beer into the primary bucket. 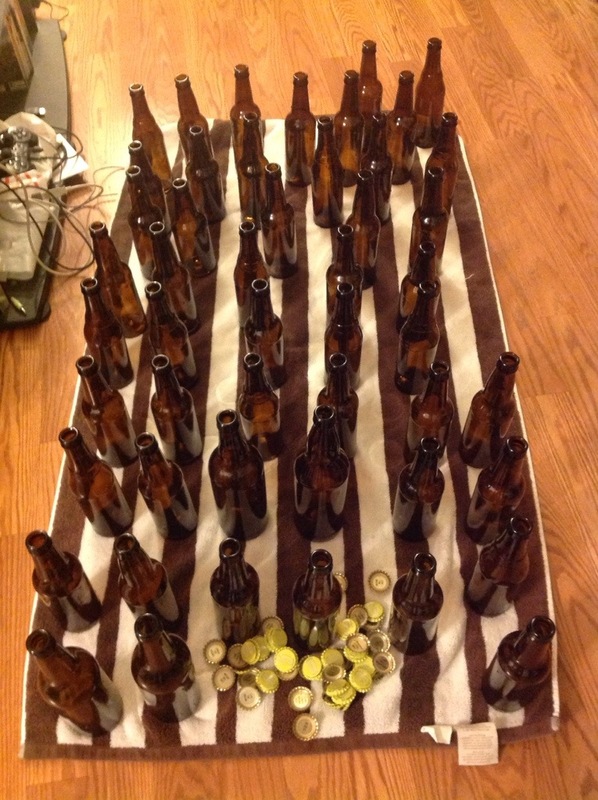 Clean and sanitized bottles ready to be filled. 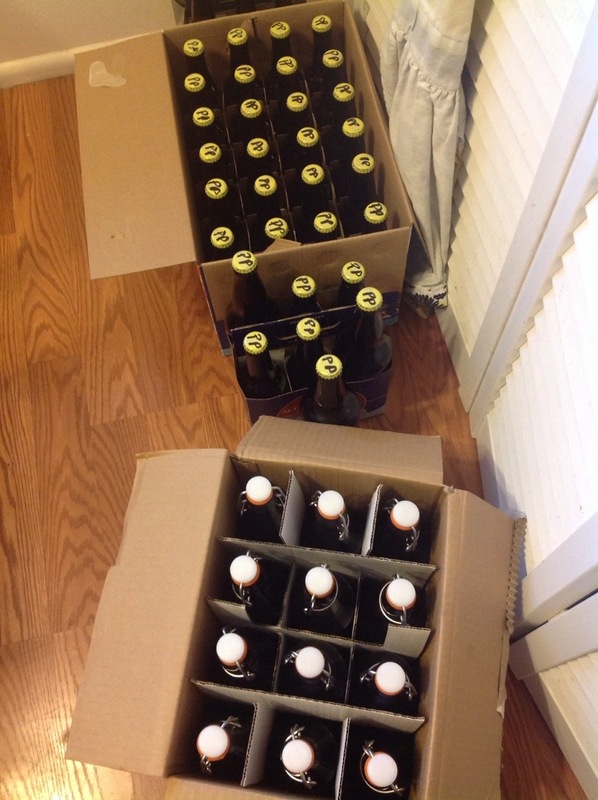 We bought a 12 pack of flip tops for fun but just reused the rest from store-bought beer. 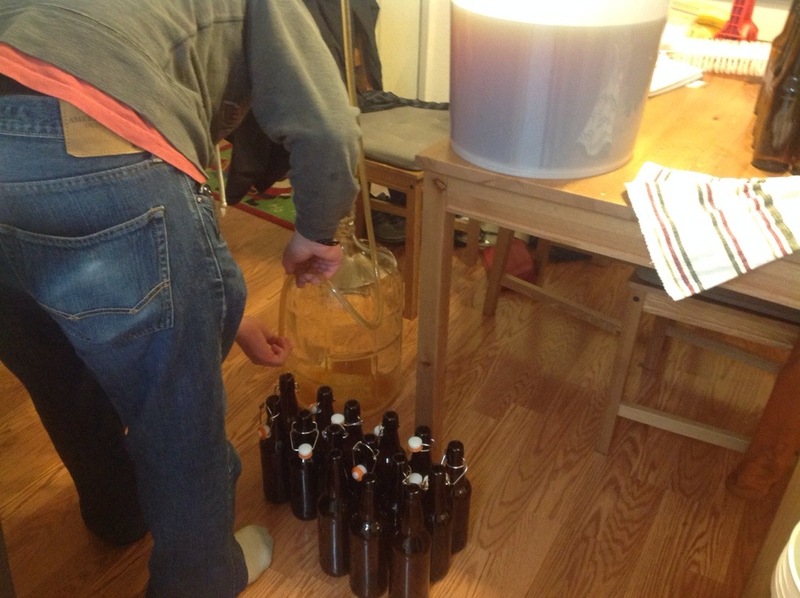 Next the primary bucket goes on the table and you fill up your sanitized bottles with beer! Today’s tip: the cool little bottle filler is totally worth it. It’s got a little valve on the bottom that’s only open when you press it against the bottom of the bottle, so when you lift up the flow of beer stops. Taking care of a few leftover sips. Cap them and ta da! Store at room temperature until they carbonate (2-3 or so weeks) then enjoy! *This post contains affiliate links. Check out the “About the Blogger” page for more information.